119 registered members (addyguy, 53' Stude, 1978elcamino, ad244, 55hambone, 2010Civic, 7 invisible), 2,197 guests, and 25 spiders. Doing some mild interior work, I found a large patch (whole wall, really - about 6.5' x 10') of drywall that was not textured with the rest of the room. There was a framed vinyl cover on the wall for a movie screen. I had thought it must have been applied after the house was finished, but I guess not! So I am trying to match the texture to the rest of the room. In the past, my experience has been only doing smaller areas and spraying some canned Homax on it or such. This is bigger and I need to get it pretty close. I have experimented in small patches with spreading some joint compound and then dabbing it with various scotch brite pads, etc. but it's not right. I am guessing there's a kind of sponge that is common? The texture is fairly smooth - e.g., it's very rounded without peaks on the individual texture dots (which the scotch brite and others leave behind). I think the area of the flash in this photo captures it. What should I try to do get a match to the rest of this wall and others? is spreading the joint compound like I was doing a legit way, or should I get something else? Last edited by Oro_O; 02/13/18 11:20 PM. Hire a pro and crack a beer. That job is too small to hire a pro. If you have a compressor, see if you can rent a stucco gun from somewhere. If not, spray cans or something idk. You could probably buy a gun for a what a pro would charge. Grout sponge possibly? Or maybe a sea sponge. Shame you don't have skip trowel which is a lot easier to mimic and hides irregularities well. That job is too small to hire a pro. No way I would hire this out, it's just far too easy and I have too much experience with materials and construction, access to tools or knowledge. I have a bunch of joint compound left over from a job two summers ago, I know I can trowel that on as mud and replicate this pattern with the right technique - which I am sure is not rocket science. Grout sponge is what I was thinking would do this. Don't have one at the moment, have used them in the past (for grout and tile work! ), can go get one. I have done some tile work in the past and I think my uncle or dad, who have done more construction work than I, told me this was common to use a grout sponge for mud texture. I had that in mind. What's a skip trowel? I haven't heard that before. I'll go google it and see. Love learning this (or any) stuff, thanks for mentioning it. Edit - oh, I see know - you mean skip trowel texturing with a mortar trowel. Didn't know it was called that. Yes, that would be easy-peasy to match! Yeah, this is very fine and regular so more work. Last edited by Oro_O; 02/14/18 01:49 AM. I just went through this in my massive home remodel. Go to Walmart or Lowes. They have a multitude of spray cans. Light Orange peel, textured etc.. work good and easy to apply. Messy though but they work good. You can try some quick drying oil base primer like Kilz or Cover stain oil primer and a 3/4" nap roller. Roll it on, let it sit for about 20-30 minutes, [when it starts to tack up] then with a damp roller [dampened with the primer] back roll into it from different angles. That should stipple it and give it that orange peel look. It's fairly easy to duplicate if you have the knack. You might have to repeat the process a few times. Depending on the depth I've also used joint compound and a carpet roller to match different textures like that. Fool around with it, I think the oil primer trick should work. What is that awful red on the wall . Blood ? Ketchup ? Last edited by Driz; 02/14/18 09:48 AM. I would re-texture the whole wall. If you want a light texture you might want to texture the untextured part as close as possible and then texture the whole wall. Are you sure it's not easier just to replace or repair all the textured drywall so that it's all not textured? Impossible to match texture-at least by a novice. With a little patience and doing as I stated above it can be done fairly easy. We've closed high hats in ceilings that had all kinds of stipple from years of painting, and when it was done no one was able to tell. The same goes for walls where windows and doors were closed up. It takes some time and patience but it can be done. OP-The key is to let the quick dry oil primer to start to set up. Then go back into it with a damp roller, and play around and experiment. You'll see how it stipples the flat surface once you give it a try. When you repaint the wall use at least a 1/2" nap roller. 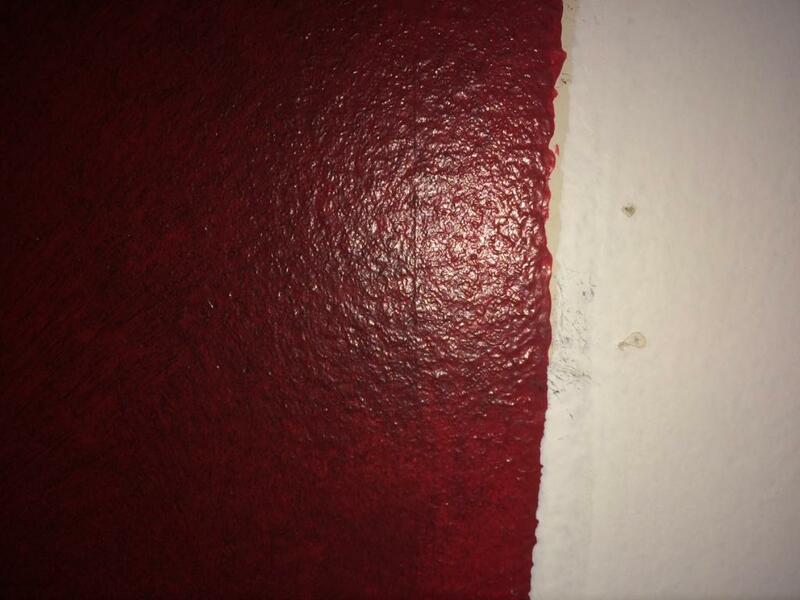 Paint the patch at least three times before coating the entire wall. Red is a PITA color to work with and can take at least three coats, possibly more to cover properly. That in and of itself will stipple the patch even more. Doing some mild interior work, I found a large patch (whole wall, really - about 6.5' x 10') of drywall that was not textured with the rest of the room. If that's the case, redo the entire wall. It'll look even that way.